Eating this turkish Dessert will make your dreams come true . 1. Preheat oven to 350 degrees F(175 degrees C). 2.In a large saucepan add the sugar,water,lemon juice and the 1 tbs of honey and bring it to a boil stirring frequently till the syrup slightly thickens. 3.once the syrup has started to thicken , take it off the heat and set it aside. 4.melt the 1 cup of butter. 5.in a bowl, mix the 3 cups of chopped pistachios and the 2 tbs of honey together. 6.grease a casserole dish with a bit of butter. 7.Grab two sheets of phyllo pastry and butter them both , stake them on each other and fold in half length wise.spoon 2 tbs of the pistachio mixture and roll it in to a small finger length roll , then Place it in to the greased casserole dish and repeat this proses until all of the phyllo sheets have been used.make sure to place the rolls tightly stuck to each other in the casserole dish . 8.spill the remaining butter on to the finished baklava rolls. 9.cook in the oven until the rolls go slightly golden yellow. 10.once the baklava rolls have been cooked ,spill the syrup Immediately onto the rolls straight after you have taken them out of the oven. 11.let the rolls soak the syrup for about 2 -2,1/2 minutes , then drain the Access syrup so the rolls don’t go soggy .let it cool down after draining the syrup.then serve. 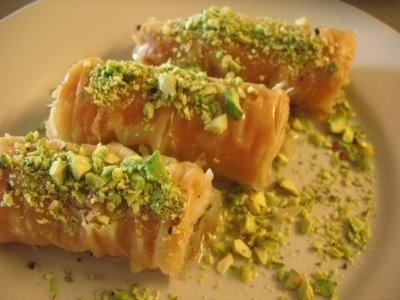 Garnish the baklava Burma rolls with grounded pistachios.take cake and I hope you liked my recipe .